Argue as we may, one of the things that our residents can come together to agree is on that we’re always willing to take a road trip. 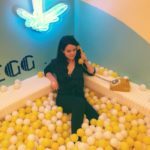 With everything you could ever possibly want to see right inside of the Empire State, there never seems to be enough time to take on all of the adventures you have planned out in your mind. 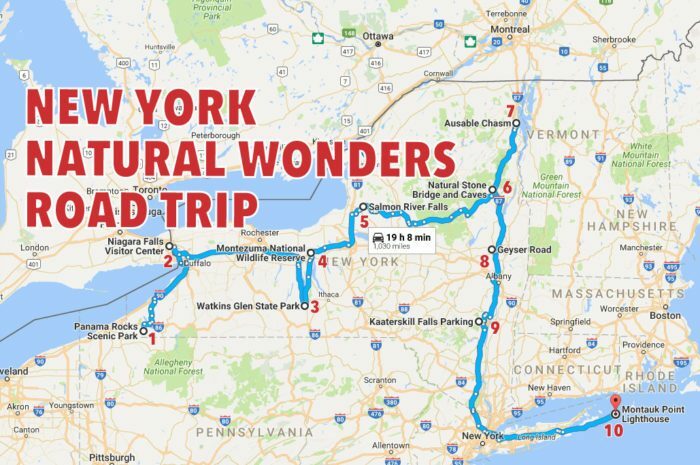 Helping you to cross off as many New York wonders from your bucket list as possible, these eleven road trips in our state are ones that you have to take before you die. 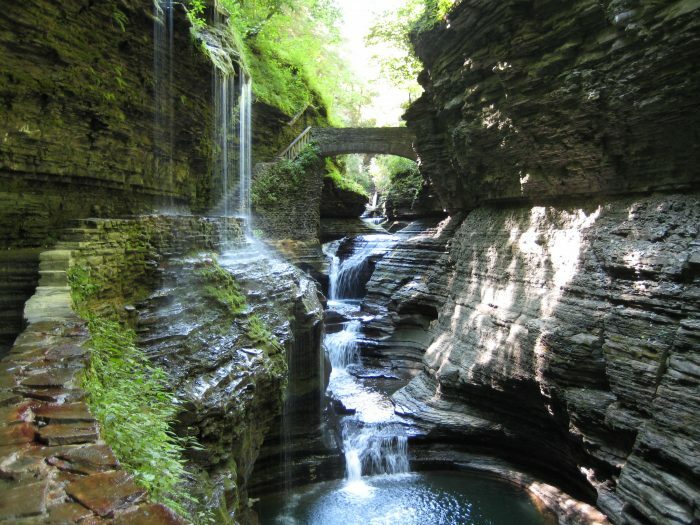 If there's one thing New York is known for, it's our gorgeous waterfalls. All over the state in almost every region you can find a nearby waterfall that's worth visiting and will take your breath away. 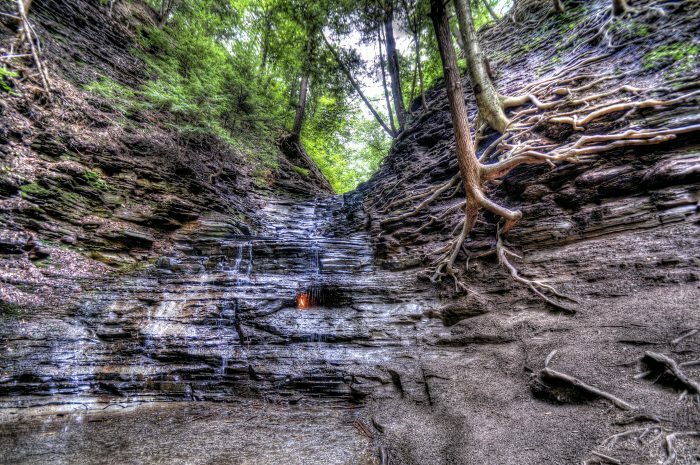 For this ultimate road trip, we brought you out to Western New York and around the Finger Lakes to see some of our most epic waterfalls that you should absolutely cross off of your bucket list. 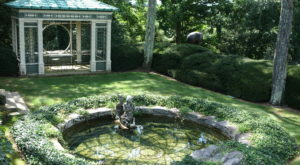 The entire trip will take you just under 9 hours of driving time, and can be broken up into a weekend full of adventure. 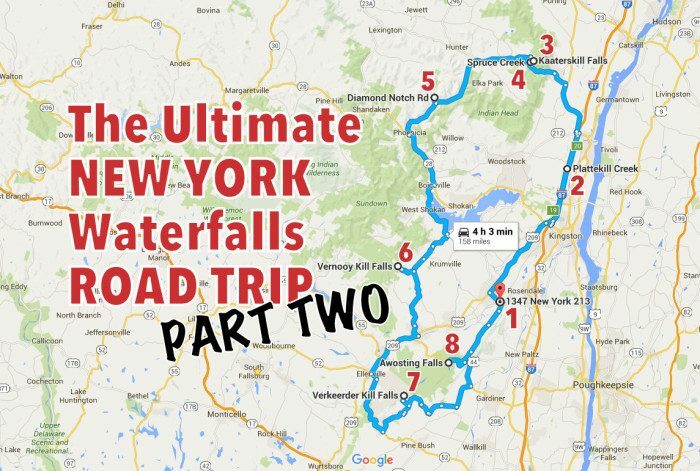 Because we couldn't fit all of our favorite waterfalls into just one trip! 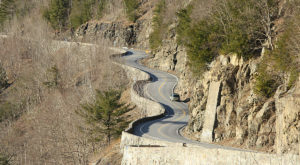 Taking you on another adventure downstate around the Catskills, this road trip has a driving time of just 4 hours and 21 minutes! 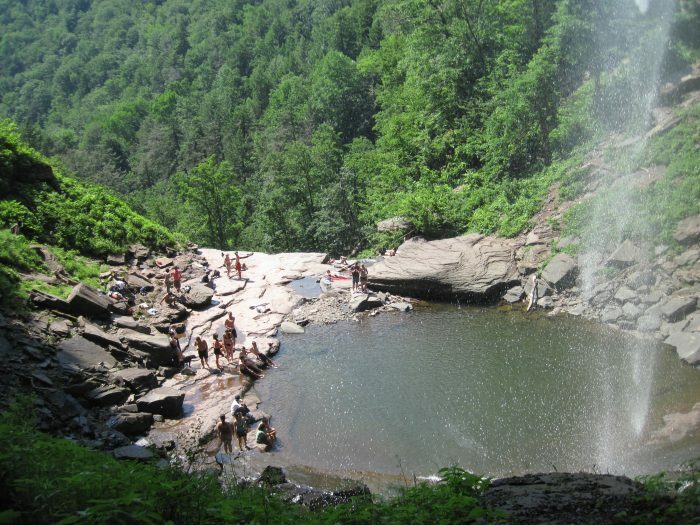 A trip that's most enjoyable during our warmer weather, you'll be able to see favorites like Kaaterskill Falls along the way. This particular road trip is a lengthy one, but if you're going looking to hit as many of our biggest and most unbelievable natural wonders as you can? Then this is the trip you should take. 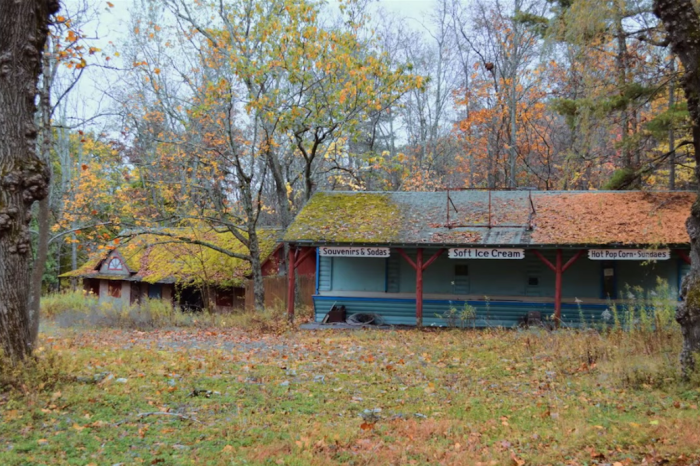 The trip features 10 locations that will get you outdoors and bring you all over New York. 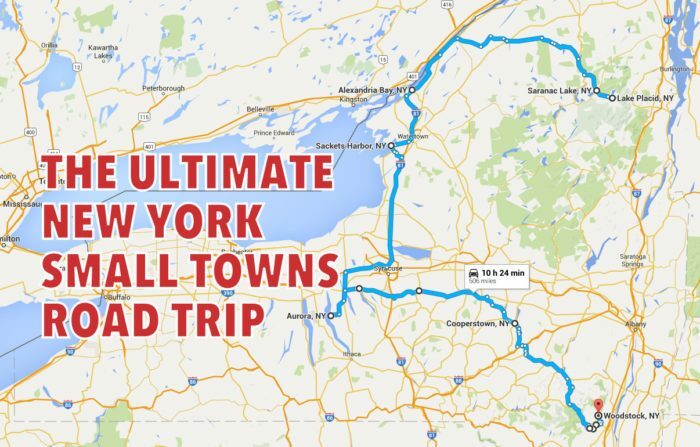 So you're looking to take a road trip that won't consume too much of your time, huh? 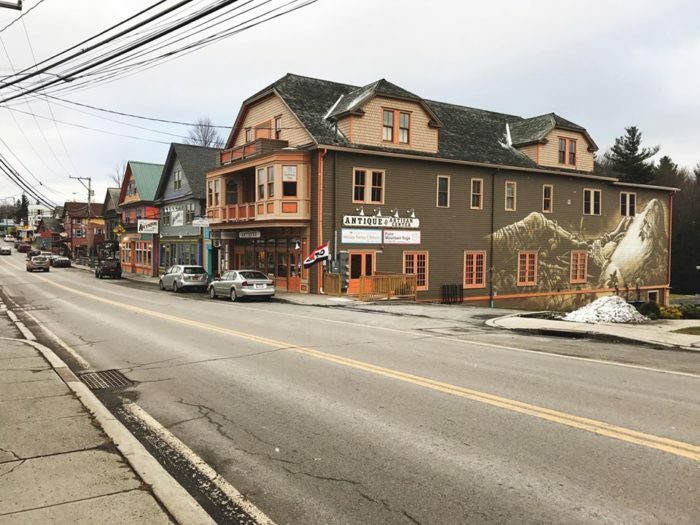 If you've yet to explore the Catskills or were looking to explore some of our most charming small towns, then taking this quick hour and a half long loop is exactly what you need. 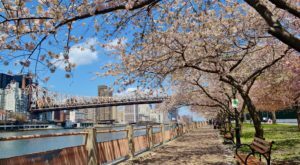 Bringing you to waterfalls and our favorite Painted Village in the Sky, this easy adventure is one you'll want to take no matter what time of year it is. This road trip is one of my favorites. 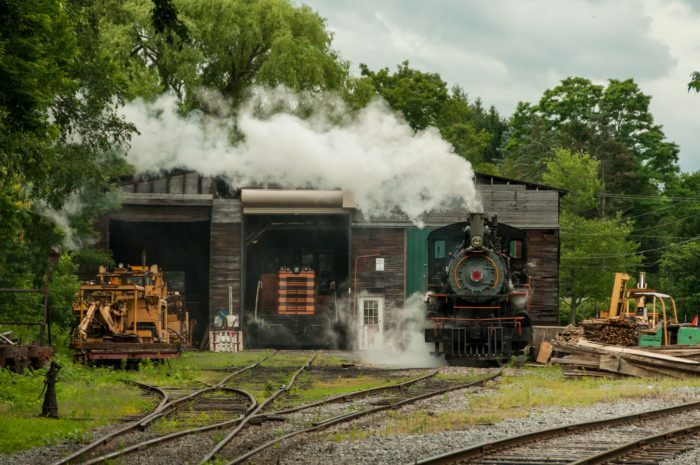 Bringing you around the Catskills and out along the Hudson River, this adventure offers a little bit of something for everyone. 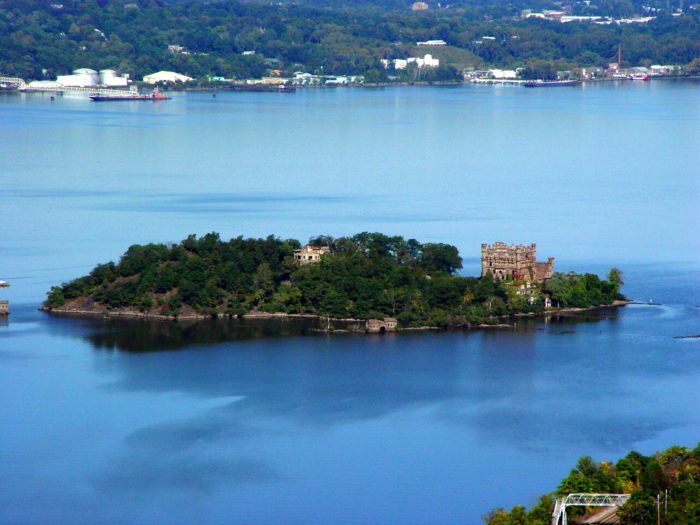 From the perfect place to eat and stay, to waterfront attractions and natural wonders that will leave you in awe, you'll love exploring this neck of the woods. A total driving time of three and a half hours, you'll have everything you need packed into one extraordinary weekend. 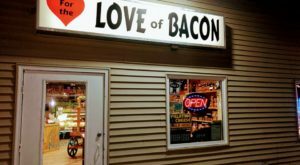 Covering as many regions as possible without giving you all the longest amount of driving time, this picturesque small towns road trip will keep you in the car for just over 10 hours. 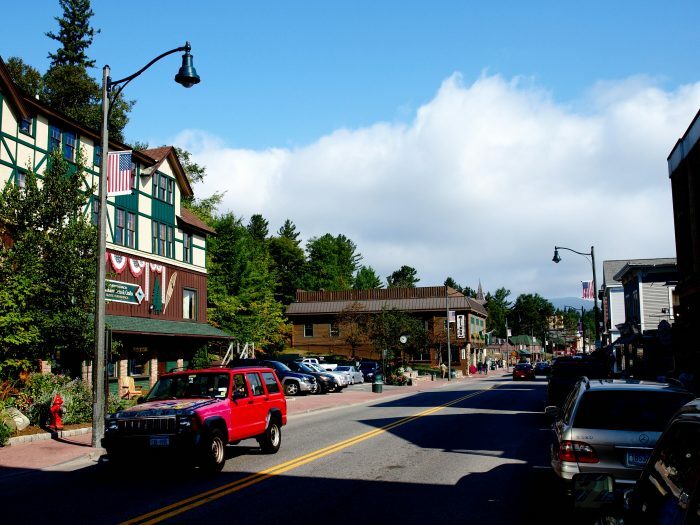 From Woodstock to Saranac Lake and Alexandria Bay to Cooperstown, you'll get a little taste of everything when you visit all of these towns that have a population of under 10,000 residents! 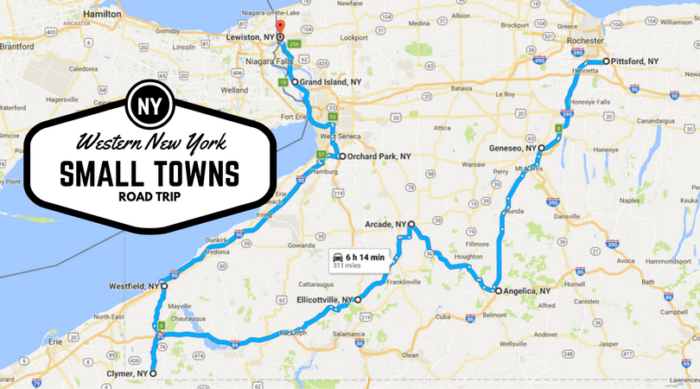 After our initial picturesque small towns post went live, we heard a ton of feedback from you lovely readers requesting a Western New York version of this trip. You asked and we listened! 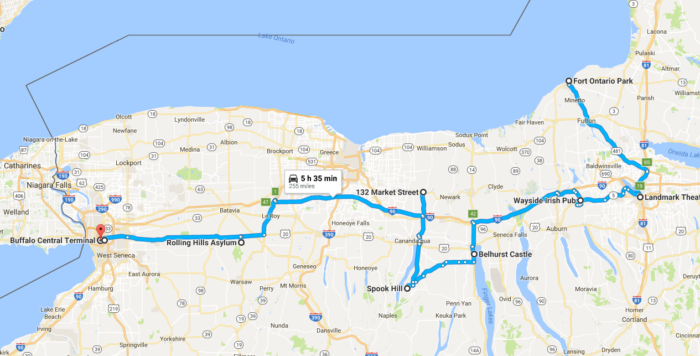 Bringing you west of the Finger Lakes and out towards Lake Erie, this incredible adventure has a total driving time of just over 6 hours. 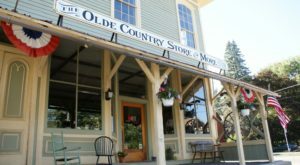 Each town on this trip features their own charming attractions, making you want to take this drive whenever you have the time! One of the absolute most beautiful times to visit and drive through New York is during our fall foliage season. 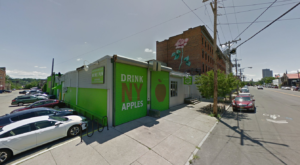 While we could argue that any spot in the Empire State is perfect for viewing the changing leaves, these nine particular locations will easily knock you off of your feet. 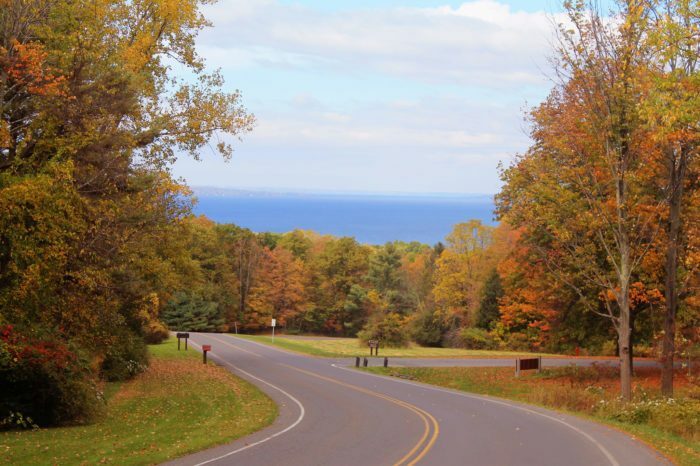 From lookout points to gorgeous state parks, you'll have the perfect variety of places to visit along the way. 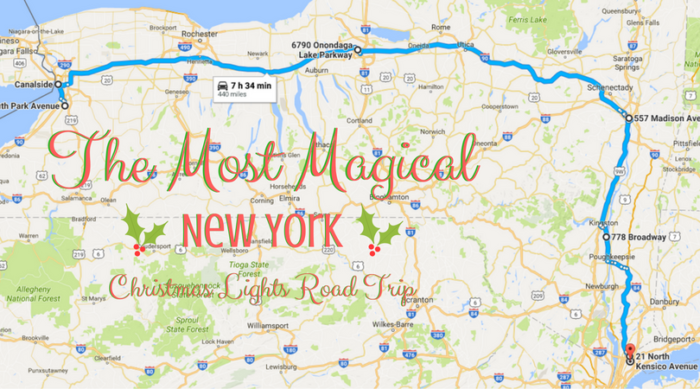 Another seasonal road trip worth taking, New York's magical Christmas lights car ride is exactly the thing you need to get you into the holiday spirit. 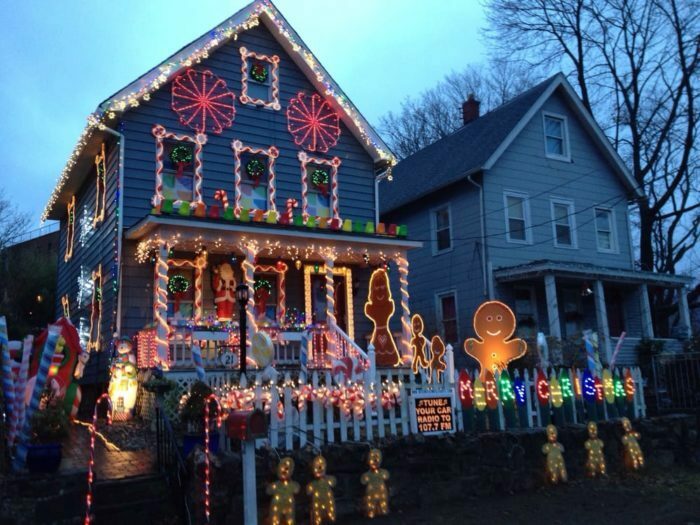 From festivals by the water to our largest light displays that you'll find in the state, you'll find yourself at a loss for words once you lay your eyes on these wonderful holiday decorations. It's a strange thought to think that some of our state's aren't filled with a considerable amount of haunted locations. But New York is! And we went ahead and made a spooky road trip out of it. 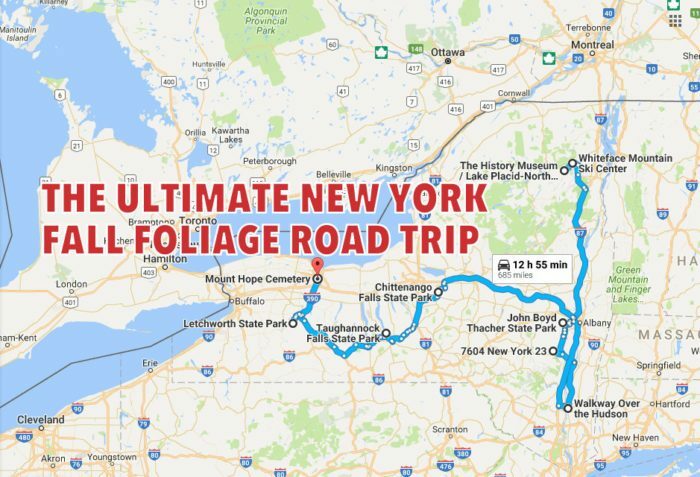 A driving time of 5 hours and 35 minutes, this chilling trip will take you across the Finger Lakes and out to Western New York. The trip itself features a variety of locations, from a restaurant, theatre, castle, asylum and museum, there's ghosts haunting places all over the state! If you thought the Western half of our state was the only area that was home to the creepy and scary, guess again! A trip that takes you downstate and out onto Long Island, your total driving time for this will be just under four and a half hours long. 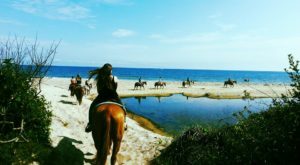 This trip itself will require you to be willing to take some outdoor adventures, with abandoned places waiting for you at the end of lonely trails and along the shores of the ocean. 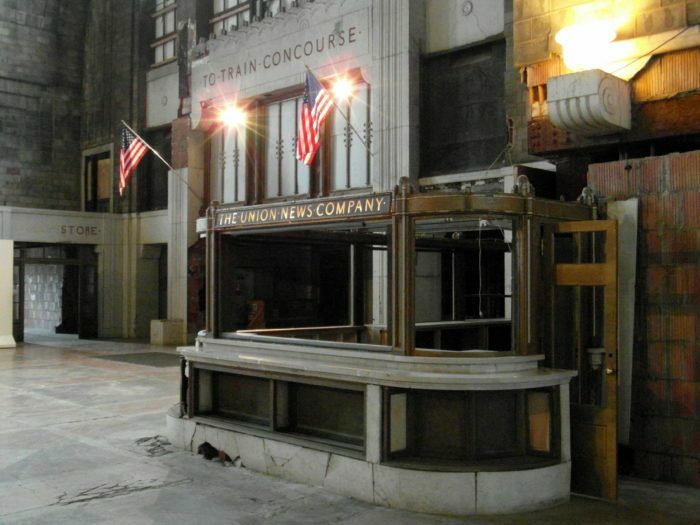 Think you're brave enough to visit all seven locations? Is there a road trip we’ve yet to create that you’d like to see put together? Speak up and let your lovely New York voices be heard. 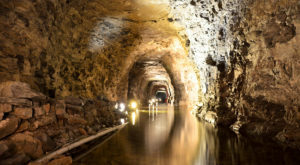 For more inspiration on where to explore in our state, try seeing how many of these 11 Hidden Gems In The Empire State you’ve already visited!